The PlayStation Vita’s library of visual novels is set to expand next month with the arrival of Otomate’s latest otome, Hakuoki: Kyoto Winds, courtesy of publisher Idea Factory. If the thought of romancing pretty samurai boys and uncovering a supernatural mystery sound appealing, this is definitely one to keep an eye on. To those unfamiliar with the otome genre, it’s essentially a deep interactive story in which the player controls a female character and builds relationships (often romantic) with a group of male suitors over the course of an adventure. There’s often branching story paths that change depending on dialogue choices made throughout the narrative, and plenty of continuous character growth among the diverse cast. In short, although “otome” literally translates to “maiden game,” there’s plenty to enjoy regardless of your gender and sexual preference, as long as you’re open-minded and can appreciate a good story. Hakuoki begins in 1864 amidst a power struggle between the Emperor of Japan and the militaristic samurai faction, the shogunate. Chizuru, the daughter of a renown doctor, has just arrived in the city of Kyoto in search of her missing father. Kyoto isn’t exactly safe during the Tokugawa period, so to avoid drawing unwanted attention she disguises herself as a man while investigating his disappearance. However, it’s not long before she finds herself amidst a group of bloodthirsty, blue-robed monsters and is taken captive by the Shinsengumi as a result. The Shinsengumi are a military unit comprised of unusually powerful ronin (the aforementioned pretty samurai boys), which was formed by the shogunate to restore order in Kyoto. Fearing Chizuru may have stumbled upon one of their darkest secrets, she’s held against her will and awaits potential execution. She avoids death, however, by revealing her true identity as a woman, and, as luck would have it, discovers the Shinsengumi have also been looking for her father. Dun dun dunnnn! In typical otome fashion, all of the action is text-based. There’s a lot of narrative that provides context and mini history lessons, while Chizuru is occasionally asked to make decisions that affect the flow of the story. Choosing to stay in your room or sneak around the temple, for instance, respectively lead to different outcomes. These routes not only incentivize additional playthroughs but determine which of the Shinsengumi she encounters, thus offering the chance to find true love amidst the chaos. For being a text-heavy game, the folks at Otomate included a few “quality of life” features that make the narrative easier to swallow. Bless their hearts. Hakuoki: Kyoto Winds takes place in Japan, so it’s a given that there’s going to be foreign terms the North American audience won’t understand. These terms are often highlighted in purple text and can be immediately defined with a simple press of the d-pad. I was also happy to discover that I could flick the left analog stick and rewind back to a previous dialogue prompt if I accidentally skipped it or wanted to choose a different response. There’s even a welcome feature that lets you hide the UI and view the current background art by pressing circle, which is great for those of us that enjoy taking screenshots–although, clearly, they end up stamped in the bottom-right corner. The story itself is quite good, tackling political intrigue and espionage without feeling overly verbose, while also dabbling in the supernatural in interesting ways. The boys of the Shinsengumi are also well distinguished from one another, which, again, incentivizes multiple playthroughs. 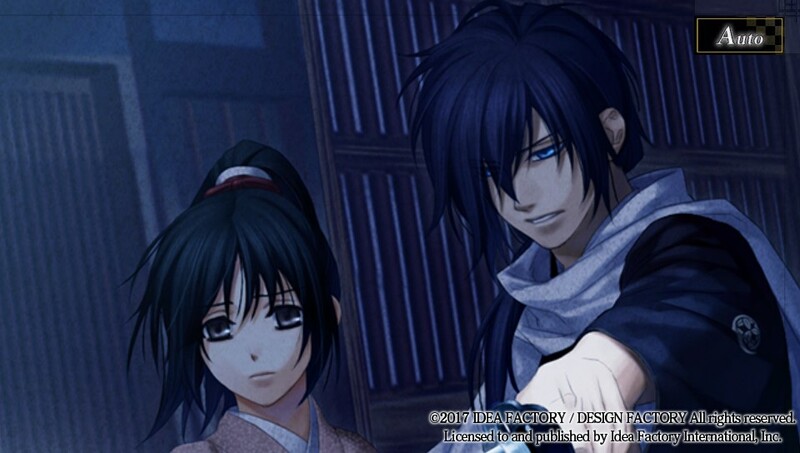 Where Hakuoki: Kyoto Winds falters, however, is how it unclearly paths the player through these romance options. There was rarely an indication as to which samurai I’d encounter, had I made one decision or another. Unlike Amnesia: Memories, for instance, where you’re given the option of who to pursue, Kyoto Winds puts all 14 up for grabs simultaneously and influences their affection levels based on your dialogue choices. While interesting, playing this type of guess-work across multiple 5-hour playthroughs isn’t how I want to spend my time. 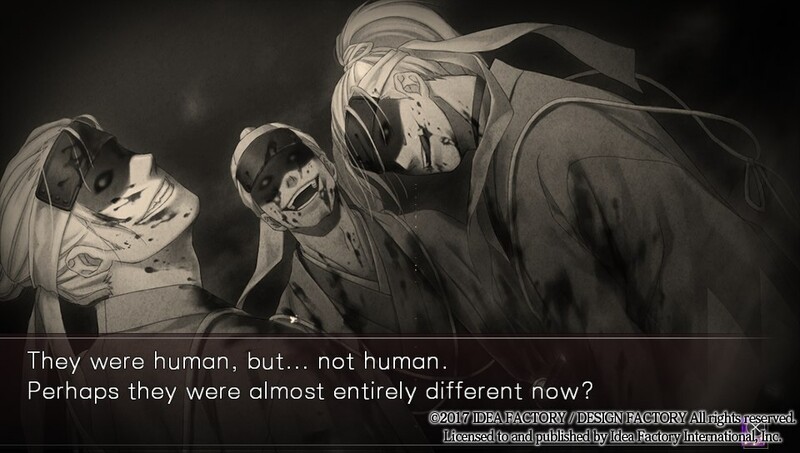 I played through Hakuoki once with the sole focus of helping Chizuru locate her missing father, and ended the game alone (which was just fine). On my next run, I tried my best to play matchmaker and still ended up alone with the exact same ending. I immediately took to Google for virtual relationship advice and discovered I wasn’t the only one struggling in the romance department. 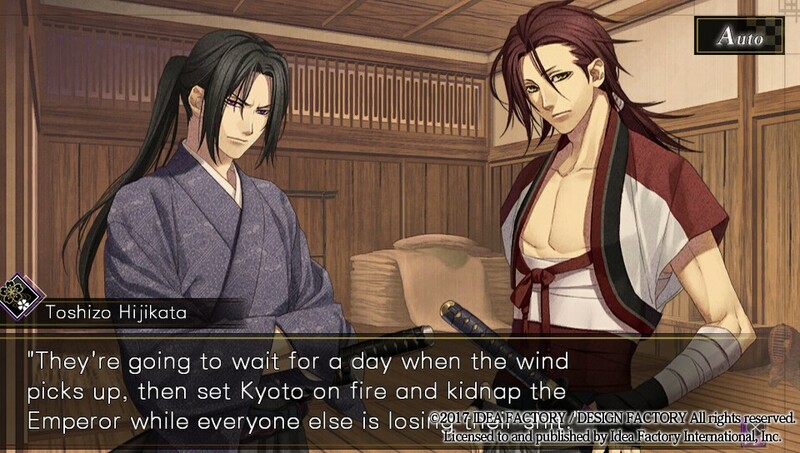 Despite the unpredictable nature of the romance features, Hakuoki: Kyoto Winds is an excellent story that kept me intrigued throughout multiple playthroughs. I loved the characters, although I admit some of their dialogue was a bit cringe-worthy and poorly translated. With Chizuru playing the damsel in distress role, her dialogue remained mostly uninteresting between bigger plot revelations. I’m invested enough in the narrative, though, that I can see myself revisiting the otome in order to see how each of the branches play out, as long as I can find a route map online somewhere. So where’s the final score? There isn’t one. I spent a lot of time conveying my opinion in the above text, and I hope that’s worth more to you than some arbitrary number or a sequence of shaded-in star shapes. Basically, I’m not a fan of scores so I no longer use them. Read the review and judge for yourself if the game is worth your time and money. Full disclosure: This review was done using a PlayStation Vita copy of Hakuoki: Kyoto Winds provided by the game’s publisher, Idea Factory. While I’m sometimes given games to critique, I pride myself on providing an unbiased review to fellow consumers, along with constructive feedback to hard working developers and publishers. Whether or not I pay for a game is irrelevant. Previous Post CA! Radio Episode 123: A Wild Drakulus Appears! Next Post It’s the Freakin’ Weekend! So What are You Playing? Intriguing. It seems like a mash up of Samurai anime, and old Infocom text adventures like Zork. It may not be everyone’s cup of tea, but with so many clamoring for something different, why not g it a shot if the story is compelling? Nice overview! That’s a good comparison, actually. I mean, you don’t get to choose directions and whatnot like Zork, but instead answer questions and make decisions that make it feel like an old “choose your own adventure” novel that takes place during the Edo period of Japan. Definitely some good stuff for those more concerned with story over action. For the last couple of years I’ve been going between “yes” and “no” regarding Hakuoki but never ended up playing it, was considering the new Vita releases but your reviews (along with the one you liked) helped me make my decision and I’ve decided to avoid the title. While I know that otome games are quite common for having a blank and/or damsel in distress heroines, in the end these titles never end up making much of an impression on me. Perhaps because it seems so rare in the otome releases we get in English, but I really do appreciate a female character who has a bit more personality to her. I might pick it up if it’s heavily discounted though, as I rather like the idea of Edo period/setting but considering how many otome titles we will get this year, I might as well wait. I did enjoy the review though, thanks! I actually like the idea of not choosing your route as the game starts, but rather seeing where my choices lead me to and which of the characters I will end up romancing, however it sounds like it was just bad design on their part? I tend to use guides to achieve all possible endings though — the first time I play by myself but then use the help of a guide. Was it still a pain to deal with with a guide or do you prefer achieving all the endings without one? I’ve yet to locate a guide, so I did all of my runs blind. If the routing was more clear it wouldn’t have been an issue. Hakuoki games are typically cheap digitally (both PSP ones are $8 on psn right now and play on Vita) but I’m not sure what the price will be for Kyoto Winds next month. If it’s in your gamble price range, give it a shot. It really is a good story, despite its flaws. Hell-o! My name is Trash and I’m a freelance games writer, an irregular podcast co-host for CA! Radio’s The Unlikely Herocast, and video game review contributor at The Well-Red Mage. I’ve also written content for Switch Player Magazine and the now-defunct Xbox-centric website What’s Your Tag? On the business side, I’ve worked with countless developers and publishers reviewing their games, such as Atlus, NIS, and Bandai Namco, and I also have experience writing guides, conducting interviews, and handling PR duties via email and social media. See the ABOUT page for more info, or contact me on Twitter @Trashlevania. It’s the Freakin’ Weekend, So What Are You Playing?